This is not a piece about Loyalist art per se. Rather, it is the narrative that explains Loyalist’s contribution to art in all its forms and how art influenced the thinking of incarcerated Loyalists. Our thinking, which underpins the reasons to write this piece, is that it is important that this narrative gets its rightful position in the annals of history and has the opportunity to challenge the typical Loyalist stereotypes. 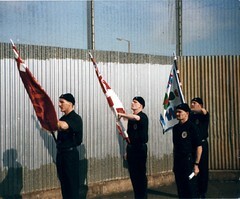 The contemporary prison tradition of Loyalists originates with the incarceration of Gusty Spence et al in 1966 and is the starting point for this article because it provides an historical back drop with a living memory of prison art in which we lived, shaped and contributed to with our comrades, while incarcerated as political prisoners. Having developed an understanding of the prison system which encompassed their physical, psychological and political well-being, Spence created a strategy and delivery plan that would empower those incarcerated. Part of this plan was to move prisoners away from institutionalisation and towards a military style camp whereby we were encouraged to integrate the military training of drilling, lectures etc. with participation in some form of handicrafts. Spence and others had learned the skills that allowed them to produce handicrafts which in turn allowed them to pass the skills to the influx of loyalist prisoners who flooded the Gaol from 1969. As well as cascading skills he was encouraging a learning environment both informally and formally. He had created an environment in the Victorian Gaol which he later transferred to Long Kesh when all political prisoners were transferred there. 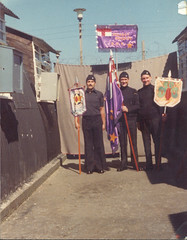 This provided Spence more scope to deliver his strategy as it was no longer a Victorian prison but was now a prisoner of war camp with the introduction of Special Category status, which drew a distinction between politically motivated prisoners and criminals. Spence’s notion of cultural expression through art was rooted in the work of the famous Shankill Road artist William Conor who was known as the ‘People’s Artist’ for his expression of life in Ulster society, through his work. Conor lived for a long time in the area of Crumlin Road Gaol and his homes would have been in the shadow of the Victorian prison. Spence was inspired by the works of Conor and by the artistic elite who revered his work for the artistic expression of life in our society in peace and war. Inspired by this, he had murals painted on the cubical walls inside the huts in each of the UVF/RHC compounds, as a matter of pride in our heritage, not just decoration. These murals were specially thought out and designed to represent our past, present and future, as well as our political expression about our country. Many represented the reality of life within the loyalist community: the poverty, the smudge-face labourers in their cloth caps who trudged home from the factories, a pawn shop on the Old Lodge Road- close to the birthplace of Conor. Even power and ambition found their way onto our walls: Stormont and City Hall, Belfast City Centre with the old red double-decker buses from the 60s, also adorned the walls of our illustrious Art Gallery. Our military history and traditions provided additional inspiration. 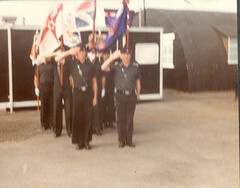 All the huts housing UVF/RHC volunteers were named after Battle Honours of the 36th Ulster Division. When we moved into St Quentin in compound 21, the mural was a 1913 UVF depiction of opposition to Home Rule. We were surrounded by art telling the stories of our culture and the influences formed the art gallery in which we lived. A favourite was one inspired by the British anti-war poet, Siegfried Sassoon. ‘Suicide in the Trenches’ depicts a UVF volunteer split down the middle by a bolt of lightning. Half of him depicts a 36th Ulster Division soldier under heavy fire in a rain-soaked WW1 trench. The other half shows a 70s volunteer incarcerated behind barbed wire and over-shadowed by watch towers. Sassoon’s poem was emblazoned underneath. Later, following my release, I wanted to explore Conor’s works and was pleasantly surprised to uncover ‘Ulster Past and Present’ as part of the Ulster Museum collection. I was drawn to this piece as it depicted Celtic warriors walking past Neolithic stones form the Giants Ring and on the other side women draped in shawls and men in cloth caps going to work. This reminded me of my favourite piece in Long Kesh as it told the story of Ulster past and present similarly to the UVF man split by lightening told the story of WW1 and the 1970s. Spence ensured that those under his command acted and behaved like prisoners of war and instilled in us that we were ambassadors for the UVF/RHC. He taught us to argue our story by using any methods of expression possible which included narratives in writing and painting in the same way William Conor expressed working-class life in his drawings and paintings. It was the Conor influence on Spence that created the elaborate paintings that depicted life of Ulster Society bringing the simple and sophisticated elements of life in a country not just divided by class but also by religion and the politics of identity. All of the aforementioned was captured in the paintings in Long Kesh not for the aesthetics but for the narrative of the Loyalist place in history. By 1973 handicraft workshops had taught new prisoners the rudiments of leatherwork. These were conducted by people like Spence who had been in Crumlin Road for a long time and had developed the use of those skills. At this time, there were no templates or stencils and much of the work was done by hand. For instance, there would have been good artists who would have drawn what you required on the leather and people with good handwriting skills to do the alphabets. If you see early leatherwork, 1972-73, you will note that all the writing would have been exclusively in that style. It was only later when the crafts became more prolific that stencils, specialist tools and stamps etc. were imported across from Canada. Even then, they were expensive and not everyone could afford to have them. In the very early days of the compounds, this was addressed by handicrafts being organised communally, again in keeping with the new thinking from Spence. This included skins of leather and all the associated tools etc. being paid for out of the central welfare funds, prior to mass orders being produced with the intention to raise contributions for the compounds’ welfare fund. One of the earliest forms of art would have been the production of hankies and was also probably the most accessible. All that was required were the hankies, a biro and a set of felt tip pens. Images on the hankies ranged from poems to pop groups, from political messages to memorials, and everything in between. By far the most popular image to appear on hankies was a drawing of the three Scottish soldiers who were early I.R.A. victims. Although the idea of all handicrafts being communal still existed, connection to the outside world was via the Orange Cross organisation, a welfare group dedicated to the well-being of U.V.F. prisoners who gathered orders and distributed and sold handicraft items on the outside to assist those on the other side of the wire. Many items became much sought after, particularly in Scotland and places like Liverpool and Preston in the north west of England. Within the prison, prison guards and soldiers had a great interest in many of the handicrafts and would always insist that whatever was being made was done so with the U.V.F. insignia upon it—or the Long Kesh name appearing somewhere to show its authenticity. Indeed one of the most sought after items in Magilligan Camp was a pin board which had been specially designed to depict a compound with Nissen huts and adorned with genuine clippings of barbed wire taken from the compound fence, usually in full view of the prison guards. The influence of art during my incarceration opened a vista that I never had before and it has enhanced my creativity. In respect of this, I believe it gives me a different angle to my practice as a Community Development worker and, in recognising from my own experiences how art can induce transformation, I have engaged Community Artists to work with residents to identify social problems and to describe the solutions, expressed here by Anne-Sophie Morrisette. “The inclusion of artists – many of whom, while Belfast residents, have never visited Mount Vernon – has had the benefit of transforming outsiders’ perceptions of the area”, (www.communityarts.net/readingroom). I would not have considered this if it had not been for the experience of the use of art while incarcerated. My incarceration gave me a different view of art as it was a form of escapism, an escapism that was not unreal; in fact on the contrary, it was an insight into creativity and its many forms that would not have been recognised by me as art. It gave me a new found confidence in culture that allowed me to define my past, present and future. “I was in awe for the first few months of my incarceration. Upon entering Compound 11 in January 1973 I came face to face for the first time with the Loyalist working class icon, Gusty Spence. What he was setting out to do then, almost forty years ago, is still overwhelming when I think about it. He single-handedly changed an institutionalised environment into one where we, the U.V.F. 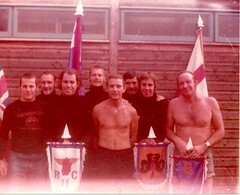 and R.H.C, controlled what way we lived. Within the constraints of walls of course, by and large we decided what we did during the day, we took our orders from the Officers and NCO’s and the only real input the prison staff had was to open up, count us and lock us again each day. I fell into this regime quite easily because I considered myself a soldier on the outside and I should be treated accordingly as a prisoner-of-war on the opposite side of the wire. I was the perfect foot soldier. I revelled in the drill and classes, partook of all the educational studies and lectures and wanted to learn all the new skills that were on offer. The ones we called, ‘the older hands’ meaning those who had been in the Crum in the sixties, were teaching handicrafts and it was amazing to see what skills they had developed. For instance, I remember one of my first days in Compound 11 being fascinated and puzzled when I saw the skins of leather hanging from the barbed wire and then even more amazed to watch Gusty, at a handicraft session, fashion a shoulder holster from one of those skins without the aid of templates – it was a whole new world. 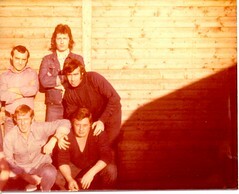 I suppose it must have been around the late 70’s, maybe 78 or 79, I had been there from 75. It was around this time that many discussion were taking place amongst people who were starting to change their outlook on how things were going on the outside and we eagerly awaited Gusty’s Twelfth day speech. There was much debate of what he would say and we spoke about it leading right up to the 12th invariably dissecting it afterwards. Gusty was also a great orator and it was inspiring to hear him deliver. He inspired me to read and latterly to write. I had a decent Grammar School education before incarceration but never learned half the things I learned while in Compounds 18 and 21. It was a privilege in many ways to be there and it was also motivational to be around so many like-minded people as well as learning from people like Gusty, Billy Mitchell, who is much under rated as a writer and Davy Ervine, who all underline what talent here was within the compound system. In 1979 an excellent educationalist moved from Magilligan prison to Long Kesh – a man named Dominic Henry. He transformed the education system and fought a long and hard battle with the NIO to introduce proper formal education into the jail. Education that included the Open University courses. With Spence’s foresight in the U.V.F. compounds at that time, there was a participatory approach to being involved with education. Many volunteers had gained O levels and some had progressed to A level and so many of them made the progression and commitment to undertake the Open University. In the years that followed, the achievements of those individuals and the collective results gained are laudable yet have went unnoticed. For example, given the background of these individuals, it is extraordinary that recent statistics show, from both the Compound and H. Block systems, 24 Loyalists worked towards or graduated with degrees. This helped affirm the link between art and education as most of the prisoners, who studied ‘The Humanities’ and ‘The History of Art’, began to express new-found creativity. It was great fun and I looked forward to it each year. From around mid-November we met and discussed ideas and worked out what the theme would be. Normally we had a series of linked set pieces and in between each act there would be a group on or a comedian, all linked up of course with an M.C. who memorably fell off his platform one year and broke his arm. The writing would try to incorporate themes of the time, politically at home and world-wide, jokes would have been made at the expense of our audience, all done light-heartedly, deliberately to take people’s minds off the added pain of incarceration at the festive period. The group had about five guys in it. All instruments were hired and sent in to us by the U.V.F. on the outside and we named the band after current pop bands only with our own slant. One year we were The Blues Brothers, and wore Linfield jumpers, another it was Sid Keyhole and the Ginger Nuts and another, They’re Throwing Stones. And surprisingly, the standard of writing was quite good albeit in always a humorous way and in many respects paved the way for a couple to take up the mantel many years later when released. In later years I came to realise the importance of proper letter writing and took pride in setting it out, making sure the grammar was correct. I used a Thesaurus to make sure I didn’t use the same word or phrase too often and I would attribute this more than anything to making me a better writer. By now, it is obvious that to prisoners, prison art was not confined to painting images which expressed a culture, tradition or history and so forth. For some, it was more than visual, it was a state of mind which encompassed writing, performing, music, education – all the ‘tools’ of creativity which were in and of themselves artistic. In this sense, art is defined as something which is universal and to which people can tune into because it moves them. Consider how one former prisoner defines it. A cubicle eight feet by eight. A hut sixty feet by twenty. A compound with a two hundred and seven metre perimeter. A box, within a box, removed from reality. An existence of tenses – living in the past, thinking of the future. Now did not exist. Reality was in the mind, a mentality. Can you feel alone in a crowded room? Isn’t silence sometimes deafening? How can you transcend incarceration? At first I wrote out of necessity, corresponding with family and friends and writing to magazines – assignments for academic study. Then in 1976 my life changed. A friend lent me a copy of Bob Dylan’s ‘Desire’. I placed it on the turntable, watched the stylus find the groove and bang…I transcended incarceration. “Pistol shots ring out in a bar room night”. “Up on the white veranda she wears a necktie and a Panama hat”. Like the character in Jack London’s “The Star Rover”, I was transported to other places within me. Through the creative genius of Dylan, I discovered the illusion of time. I could lose myself in a world of imagery, surrealism, chaos, for long periods. I learnt being creative is an exploration, it is limitless. To some it is visual, some aural, some written. In Dylan it is all of these. When he sang of murder on the streets of Patterson, New Jersey, I was there. This was the catalyst which ignited my creativity. I began to ‘colour’ my letters home. I wrote songs about loved ones. Once a year we had a Christmas concert and with others I wrote comedy sketches, caricatures, satire. For this individual, such expression of art found a collective outlet beyond the walls of Long Kesh. This was in the formation of ‘Etcetera’, Theatre Company, a small group of former prisoners and others, developed to enlighten audiences to what prison life was like. In partnership with ‘Epic’, Ex-Prisoners Interpretative Centre, they produced a fifteen minute drama entitled ‘Yo Mister’ as part of an interactive exhibition of ex-prisoners’ memorabilia. Following its debut production in October 1999, directed by the community arts director Tom Magill, it toured to ten other venues throughout Northern Ireland and was subsequently performed in the Linen Hall Library by the well-known local actor Richard Dormer as part of ‘Tinderbox’s’ “New Writers” project. 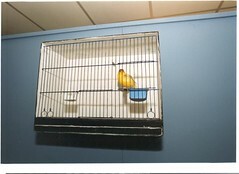 Albeit a small-scale example, this is indicative of the contribution to transformation of former prisoners who diminish their role in contributing to the world of art because of a reticence to raise their profile due to negative media attention which often dilutes their art and ‘dampens’ their further involvement. For example, it might not be widely known that what was billed, at the time, within the 2000 Cathedral Quarter Arts Festival, “as the biggest community drama ever in Ireland, Playing For Time”, was written by a former UVF prisoner. Whilst critics say the script may have benefited from some editing and the massive Paint Hall Studio venue may have been too big, Roisin Ingle in ‘The Irish Times’ wrote “this was a dramatic spectacle with more heart and imagination than many professional productions and should have been judged on a script that, while flawed, tried hard to make sense of one of the most disturbing characteristics in post-Agreement society”. I started writing around the time of the first Drumcree. I wrote a little testimony to warn young people of the perils of going down the road I trod so many years before. I delivered that testimony to many young people throughout Northern Ireland and this whetted my appetite to write and I continued with short stories. I kept all this stuff to myself because I wasn’t sure what to do with it and I also had the notion that others might not find it very good. Eventually I wrote a draft of a full length play and showed it to some close friends. Unknown to me one of those friends passed the draft along to a professional script reader who basically got in touch with me, organised a reading, and went about securing funding to have it produced. I was very excited and when a couple of top actors were lined up to play in it, I suppose I became aware that I had produced something of quality. That feeling turned to despair within days of the play being performed. The detrimental press coverage I received made me re-think all I was trying to do, to such an effect that I considered stopping writing. Luckily I haven’t but the lessons are there for others. However, what cannot be ignored is that when they do ‘raise their heads above the parapet’, those with a more balanced objective perspective will be honest in what they witness such as Jane Coyle’s assessment, in the ‘Belfast Telegraph’, of a former prisoner’s art. “A Catholic from west Belfast has come together in friendship and creative partnership with a writer, former loyalist prisoner from north Belfast, with a cast from across the community. The play shows the sophistication developing at the grass roots, it has no flags, no emblems, no overt sectarian allegiances, and allows the audience to make up its own mind as to where the characters stand. They are living proof that, for all the depressing public announcements and political prevarications to which the Northern Ireland public is regularly subjected, the peace process is moving forward”. 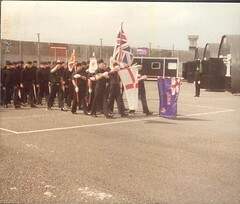 In the late 80’s and early 90’s when most of the Loyalist prisoners were being released, the compound men, many of whom had been there from the early 70’s, found themselves in what would be considered ordinary every day mundane type of jobs. They fell in to the family way and most relinquished violence having seen the futility of the countless deaths. Some went on to greater things such as, councillors, politicians, lecturers, community workers, teachers, but for some reason very little choose to write, not just about the prison experience but about anything. Why not? Perhaps it was a lack of confidence in their own ability that they didn’t think anyone would be interested, or did they want to keep things to themselves? 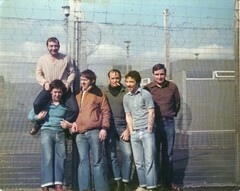 There have been many Loyalist ex-prisoners who have written upon release, and in later years, but have kept it hidden. Even in response to some overtly republican myths, especially around the prison experience during the most recent conflict they, in their wisdom have decided not to come forward. To witness such one sided plays as Martin Lynch’s ‘Chronicles of Long Kesh’ is demoralising for those prisoners who have never considered themselves, as portrayed in Lynch’s production, to be drink swilling psychopathic Taig haters. And yet very little responed. The perception in many people’s minds, greatly enhanced by totally biased media reportage now, is that in the past conflict nationalists and republicans were the good guys—Loyalists were the baddies. History is being re –written as we progress and is depicting Loyalism in a very unfavourable light. This is very true when it comes to people with that background trying to forge ahead and promote whatever skills they have. If they don’t try to record their experiences then all is lost as far as educating people goes. If they do raise their heads they are vilified for being an ex-prisoner. If you don’t try to change you are a dinosaur, yet if you do then the finger is pointed at you to say, “hold on a minute, what are you doing, you don’t have the right to change because you had a past”. This has had an extremely detrimental effect on many people wanting to write. However, in spite of the undoubted ability of making a worthwhile contribution to the arts, former Loyalist prisoners continue to struggle to overcome the negative stereotype portrayal widely accepted by society. Maybe the collective response to incarceration will one day be replicated in a creative expression which artistically portrays their role in history. Have you considered adding some videos to your article? I think it will really enhance everyones understanding.